A wonderful opportunity to visit Belfast! As well as a chance to shop and explore in Belfast city centre, this tour also gives you an opportunity to visit Kildare Village, the Quays Shopping Centre in Newry and Dundrum Town Centre. Plenty room for all the shopping bags! 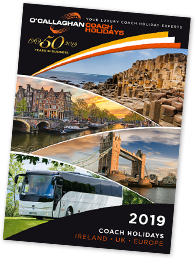 Board your luxury coach and depart for Belfast. Begin your shopping experience with a short visit to Kildare Village before travelling on to the Quays Shopping Centre in Newry, Co. Down which boasts over 50 outlets. From here we travel on to our hotel in Belfast. Enjoy a full day in Belfast City today where where you can shop until you drop or enjoy a day exploring beautiful Belfast! The city has so much to offer – take a city tour, visit the Titanic Experience or the beautiful Botanic Gardens or spend the day shopping in the city’s bustling Victoria Centre quarter. Today we will stop in Dublin to visit Dundrum Town Centre where you can enjoy some more free time and fill those bags before the final leg of your journey home.